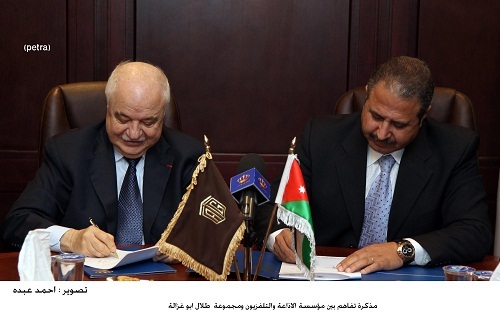 AMMAN - Jordan Radio and TV Corporation (JRTVC) and Talal Abu-Ghazaleh Organization (TAG-Org) signed a Memorandum of Understanding (MoU) to develop the technological services submitted by the Corporation and enhance IT skills of its staff. The MoU was signed by JRTVC Director General Ramadan Al Rawahdeh and HE Dr. Talal Abu-Ghazaleh, chairman of Talal Abu-Ghazaleh Organization (TAG-Org). TAG-Org will design the website in conformity with the Corporation’s colors and policies and will develop the central news system consisting of news, photos, events, videos, MP3 files among others in addition to the search engine within the news, advertisements, polls, archive and a copy of the website on mobiles (news, search and main pages). In the field of training and qualifying courses, the MoU stated the organization of training courses for the Corporation’s staff in 2013 according to the training scheme of Talal Abu-Ghazaleh for Professional Training/Amman Office, Abu-Ghazaleh Knowledge Society, Talal Abu-Ghazaleh Translation, Distribution and Publishing. From another side, the JRTVC will provide TAG-Org with the specialized courses to be held by the organization for more promotion inside and outside the Kingdom in addition to recognize the training center at the Corporation to become an accredited center for Talal Abu-Ghazaleh Cambridge IT Skills certificate exams while providing the Corporation with the accredited training curriculum. In the meantime, the JRTVC will be committed, through the MoU, to refer to TAG-Org in its websites, to cover the Organization’s news, events and to host its experts in programs and meeting conducted by the Corporation. For his part, Rawashdeh expressed the Corporation’s appreciation for TAG-Org’s support and commended its efforts in providing its services and programs all around the world which indicates the capacity of the successful Arab professional organization in access to globalism. He also commended the interactive role of TAG-Org represented by launching projects and initiatives that contribute to boosting economic and social development. HE Dr. Abu-Ghazaleh expressed his satisfaction for the cooperation with one of the professional national institutions in the country which is considered our media outlet that carries out its role in serving the state and citizens stressing that it’s an organization for all the Jordanians as it adopts the Jordanian interests and broadcast them in the finest image. He added “our cooperation with JRTV Corporation is the literal proof of partnership between the public and private sectors and it’s within our corporate social responsibility towards the society and country” pointing out that the partnership that unites Talal Abu-Ghazaleh Organization and the German Jordanian University has resulted in the establishment of Talal Abu-Ghazaleh Graduate School of Business Administration (TAGSB) five years ago and proved that it’s a success story for the two public and private sectors. HE Abu-Ghazaleh called for upgrading the performance of the media outlets to cope with all the development in the ICT field mainly in the media arena.